​Hometown: Manahawkin, New Jersey, U.S.
Died: August 6, 2007 in Operation Iraqi Freedom. Unit: 1st Battalion, 23rd Infantry Regiment, 3rd Brigade, 2nd Infantry Division (Stryker Brigade Combat Team), Fort Lewis, WA. Spc. 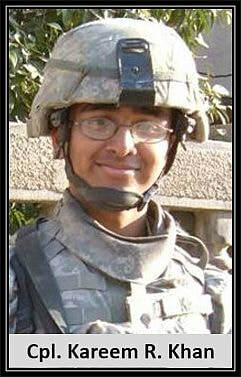 Kareem R. Khan of Manahawkin, N.J. enlisted July 21, 2005 right after graduating from Southern Regional High School. 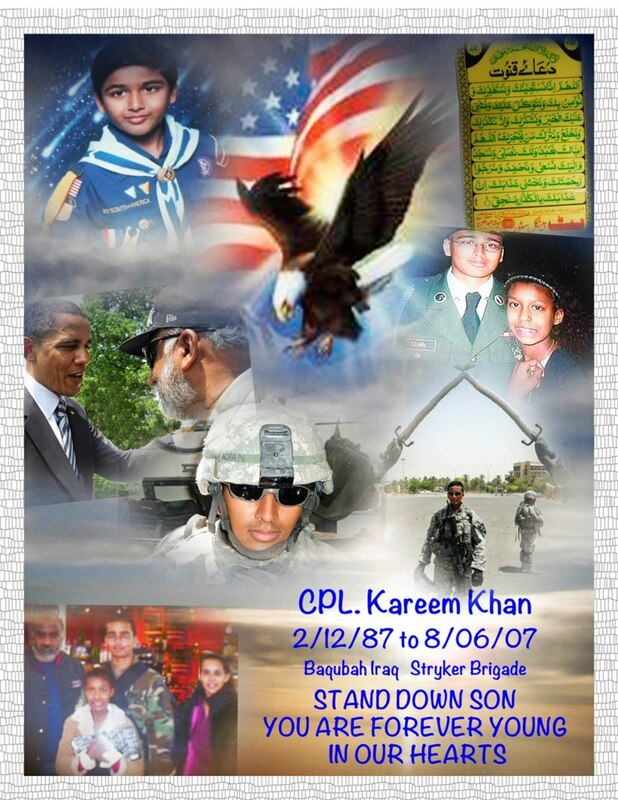 As a freshman at Southern Regional High School, Khan enrolled in the district's Air Force Junior ROTC program. During his one year in the program, he proved himself to be solid student and citizen. He wanted to show that not every Muslim was a fanatic and that some would risk their lives for America. Though his father "spoiled him rotten," Kareem was always a polite teenager, who respected his elders. His father's favorite memory is when Kareem used to wake up at 5 a.m. on weekends to accompany his dad at work at a local marina. He loved to watch football with his dad, cheering on the Dallas Cowboys during Sunday afternoon or Monday night games, while munching on popcorn. He also used to challenge his little stepsister to video games. The two would spend hours sprawled out on the living room floor and sometimes Kareem would try to show her how to do certain moves, and ended up taking over the controller. Aliya looked up to her stepbrother and she was proud when he came with her to school and talked to her class at Southern Regional Intermediate School during his leave. Later, he came with her to the school book fair. The family used to send two large bags of Starbursts in his care packages, because Kareem would pick out all the orange ones and leave the rest for his Army buddies. He was also a big fan of Disneyworld, as was the entire family. The family would take at least one trip to Disneyworld every year, and the living room and dining room of the family's split-level home is filled with souvenirs from those trips, like a wall hanging of Cinderella, figurines of Mickey Mouse and Disney-themed snow globes. Kareem was so crazy about Disneyworld that when he had a two-day leave following his graduation from Fort Benning, Ga., he had a backpack full of clothes stashed in the bush, so the family could immediately drive to Florida. Khan was sent to Iraq in July 2006, after spending a year at Fort Lewis near Tacoma, Wash. He came home for two weeks in September 2006 and was supposed to be home permanently last month, but his tour was extended through the end of September 2007. At the end of his tour, Kareem was considering re-enlisting or going to medical school. He worked with a medic unit when he first got to Iraq. When he came home to visit, he was happy to stay at home, even asking his mother, who lives in Maryland, to come up to New Jersey to visit. He had been awarded the Purple Heart for injuries from previous combat. His awards and decorations include the Bronze Star, Purple Heart and Army Commendation Medal. His family received a purple heart, a bronze star, and a good conduct medal he received during his tour of duty. He died in Baqubah, Iraq, of wounds suffered from an improvised explosive device at age 20. Army, 1st Battalion, 23rd Infantry Regiment, 3rd Brigade, 2nd Infantry Division, Stryker Brigade Combat Team, Fort Lewis, Wash.
Feroze Khan's favorite memory is when Kareem used to wake up at 5 a.m. on weekends to accompany his dad at work at a local marina. "Not many kids would get up at 5 a.m.," he said. "He's really funny," said Aliya. "We used to play video games and sometimes we would play with my birds." Aliya said she looked up to her stepbrother and she was "really happy," when he came with her to class at Southern Regional Intermediate School during his leave last September. Afterward he accompanied her to the school book fair. "I was proud," she said. Kareem was a "total goofball," said Feroze Khan. The family used to send two large bags of Starburst candies in his care packages, because Kareem would pick out all the orange ones and leave the rest for his Army buddies. He was also a big fan of the Disney World theme parks, as was the entire family. They would take at least one trip a year to Orlando, Florida, and the living room and dining room of the family's split-level home is filled with souvenirs from those trips, like a wall hanging of Cinderella, figurines of Mickey Mouse and Disney-themed snow globes. As a freshman at Southern Regional High School, Kareem enrolled in the district's Air Force Junior ROTC program. During his one year in the program, he proved to be a solid student and citizen, said Col. Michael Mestemaker. "He was a good kid. He did whatever we asked of him," he said. Stafford Mayor Carl Block said his "heart goes out to the family. We have been very pro-veteran in the past, and we'll surely follow this up immediately" by planning an official memorial for Khan. Representative Jim Saxton, R-New Jersey, received word of Khan's death through Army officials on Thursday. "I express my deepest regrets for the family of Specialist Khan. His service to the Army and the 2nd Infantry Division is truly honorable. It's a sad loss for us all," he said. "He has so much promise, he could've done anything with himself," said Joe Hawk, 42, of Bayville, who Feroze Khan described as a very special friend of the family. "When he joined, his dad was devastated," said Hawk, "but I told him you can't fault him for that. His father raised him to give, and he gave his life." Nisha Khan said seeing the soldier come to tell of Kareem's death was like nothing she's ever experienced. "You see it in the movies, but you wouldn't know the emptiness of seeing them in your driveway," she said. In her grief, she blindly hit out at those bringing the news, she said. "He promised me he'd come home," she said, as Aliya held her mother close to comfort her. "His dad is devastated," said Hawk. "Kareem was his life. A father shouldn't bury his child." So when his father, Feroze "Roy" Khan, saw three soldiers walking up to his door on Monday, he knew what it meant. "It's something I wouldn't wish on my worst enemy," Feroze Khan, 49, said Thursday night at his home in the Ocean Acres section of Manahawkin. Khan's faith in Islam is important now to his father and stepmother, Nisha Khan, because they want to make sure people in America know that Muslims like Kareem were willing to fight for their country. "His Muslim faith did not make him not want to go. It never stopped him," said Feroze Khan. "He looked at it that he's American and he has a job to do." The last package Nisha Khan, 40, sent her stepson included a necklace that had Kareem's name in Arabic, next to the word "Bismillah," which means praise to Allah. In the Islamic tradition, last rites must be within a few days of death. 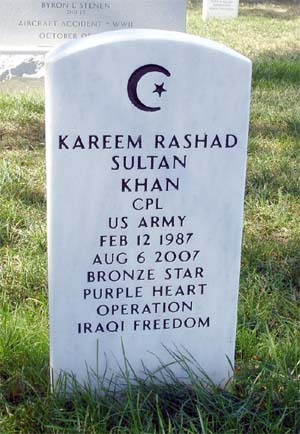 Khan's funeral at Arlington National Cemetery in Virginia is scheduled Thursday. The family will perform traditional Islamic rites at home and have a full military burial. "Hopefully Allah will understand," said Nisha Khan. Though his father "spoiled him rotten," according to both his dad and stepmom, Kareem was always a polite teenager, who respected his elders. "For a teenager, he was a very obedient child," said Nisha Khan.